Sometimes you might want to quickly create a disc menu for your ready personal DVD or Blu-ray video without the necessity of re-encoding. For this purpose you can also use MPEG-2 video with DVD parameters or video files encoded with the MPEG-2 or H.264 video codec and turn them into the full-fledged DVD/Blu-ray with menu without re-encoding. 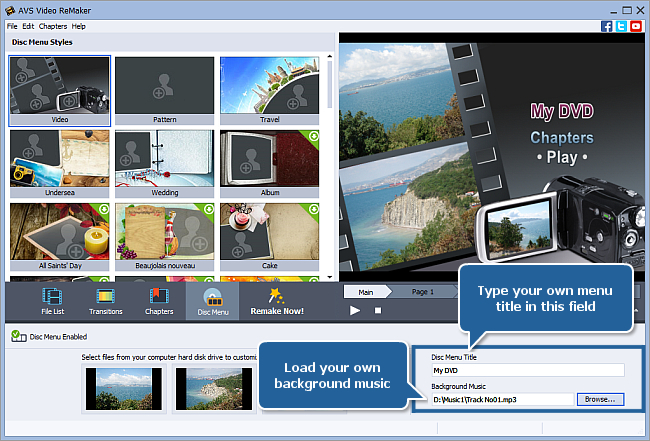 Using AVS Video ReMaker you will be able to split your video into several chapters, create a single-level disc menu using ready-to-use style presets and customize it adding your own images and background music. After loading your video, you can add more video files to AVS Video ReMaker using the Add File button or remove the loaded files clicking the Clear button. If you need to cut out some unwanted clips from your video please refer to the How to edit home DVD video with AVS Video ReMaker? guide to learn how to do it. Click the Chapters central button to start working with chapters. To create a chapter, left-click within the Timeline Scale in the place where you want the chapter to begin, then press the Add Chapter button. The same way all other chapters are created. 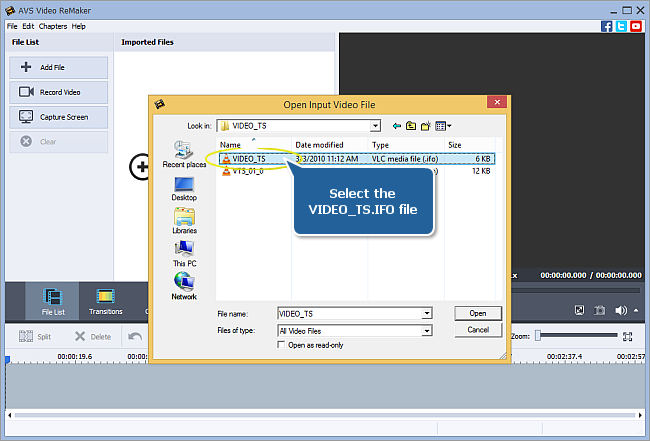 At the Beginning of Each Clip – use it if you have previously split one video file into several clips or loaded several video files into the program. The chapters will be added at the beginning of each clip or file. If the only loaded file is not split into clips, only one chapter will be created at the beginning of the file. To split your video click the File List central button, left-click your video on the Timeline where you want a new clip to begin and press the Split button on the Timeline Toolbar. At a Time Interval – use it if you want to assign a time interval at which chapters will be added. If you select this option the Interval window is opened where you can select the needed time value. 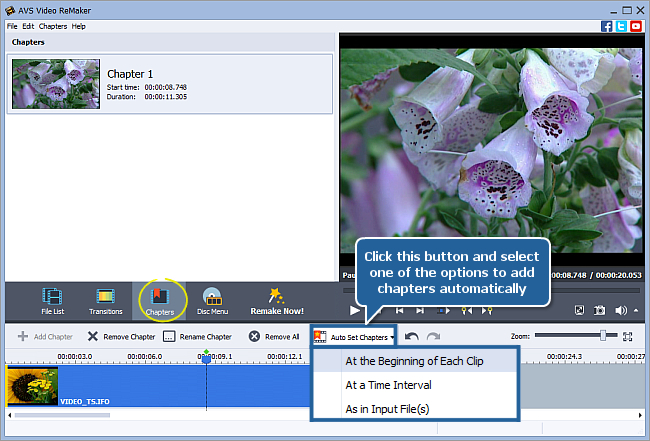 As in Input File(s) – use it if your original video already includes chapters. 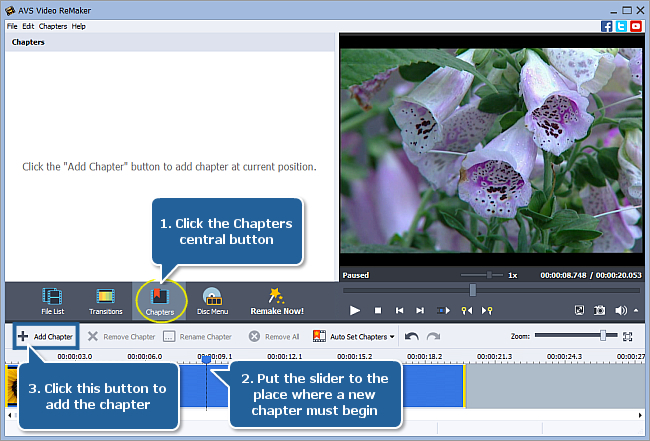 To delete the unwanted chapter select it with the mouse and use the Remove Chapter button on the Timeline Toolbar. To delete all the created chapters use the Remove All button. 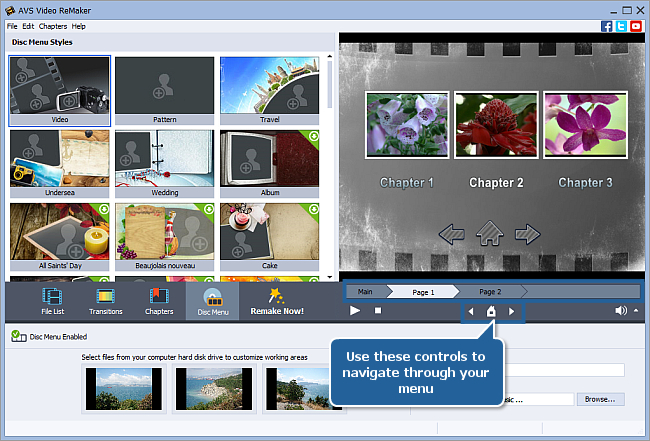 Click the Disc Menu central button and make sure that the Disc Menu Enabled option is checked. To apply one of the menu style presets double-click it in the Disc Menu Styles list. Note: if a menu style preset is marked with a green icon it means that only a preview is available for this preset in the program. To use such preset you need to download a full presets version from our web site. Depending on the selected preset several Working Areas can be available in the lower part of the program window. To customize a working area left-click it, select an image or video file in the opened Windows Explorer window and press Open. 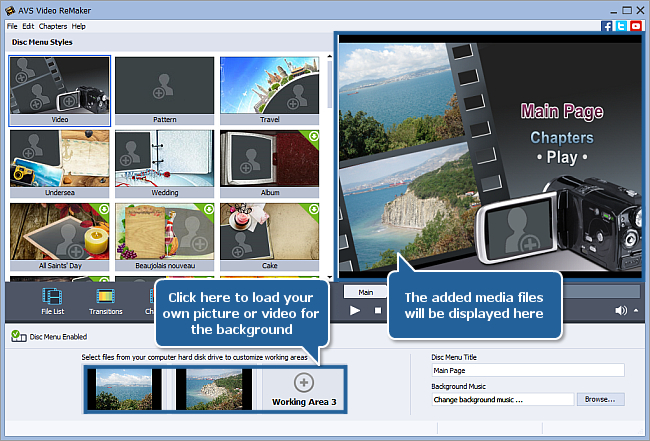 The selected media file will be displayed in place of the empty working area on the menu page in the Preview window. To replace the added media file left-click the used working area at the bottom of the program window once again. Use the navigation buttons below the Preview window to preview your menu pages. In the lower right part of the program window type your own title in the Disc Menu Title field. To add music that will be played during representation of your disc menu click the Browse button next to the Background Music field, select an audio file in the Windows Explorer window and click Open. 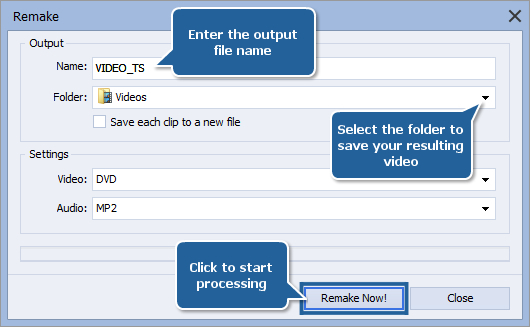 In the Output section of the Remake window enter the output file Name into the appropriate field, select the Folder to save your resulting video and choose the DVD or Blu-ray Video format and one of the available Audio formats in the Settings section. Insert a blank DVD/Blu-ray into your computer optical disc drive. Make sure that the disc is compatible with your drive. Now your disc with the created menu is ready to be watched using your personal computer or home DVD or Blu-ray player!